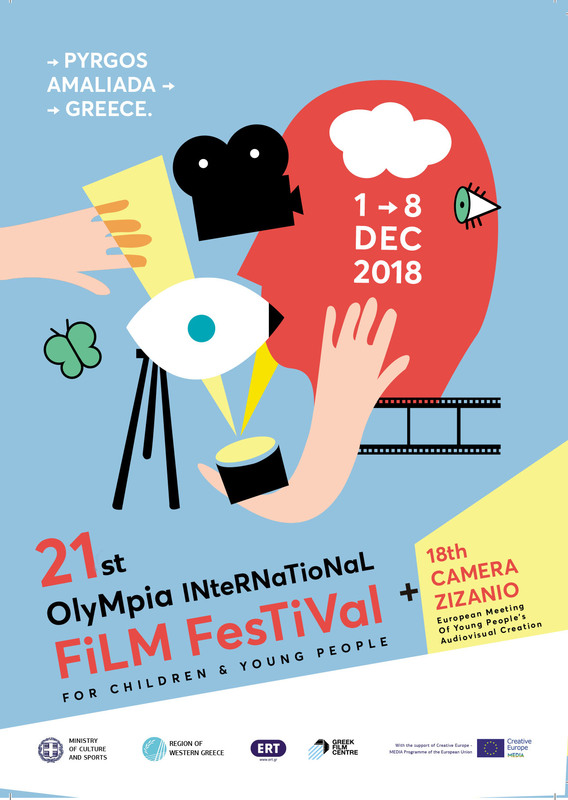 The cinematic workshops, one of the most dynamic parts of the Olympia International Film Festival for Children and Young People and Camera Zizanio, will be available this year as well, to offer unique moments of creation to children and young people. The participants, under the guidance of professionals, are initiated in the secrets of cinematography and its various kinds (fiction, documentary, animation) and are guided into film creation. The workshops offer the opportunity to participate, to dozens of students of all school levels from the Prefecture of Ileia as well as to the young visitors from Greece and abroad. For the duration of one week, the whole town of Pyrgos is transformed into a huge filming stage, the likes of which, cannot be found in any other part of Greece. – Direction-Editing workshop for secondary education students from Ileia. During the workshop the participants produce one or two short fiction films. Workshop coordinators, the directors-editors Giorgos Kourmouzas and Christos Santatsoglou. Duration: 5 days, 3 hours per day. – Animation workshop for secondary education students from Ileia. During the workshop the participants produce one or two short animation films. Workshop coordinators, the professional animators Kostas Katrakis and Tasos Zervas. Duration: 5 days, 3 hours per day. – Documentary workshop that produces the legendary by now, Zizanio News! A four minute daily film that offers a different viewpoint of the Festival, the town, the people. The Zizanio News shorts are screened every evening at 20.30 at the Apollo Theatre and are available online. The team of Zizanio News includes former “Zizania” and secondary education students that have taken part in workshops during the previous years. Workshop coordinator, the director Nikos Theodosiou. Duration: 5 days, many hours per day. – Clay animation workshop for primary education students. Workshop coordinators: Vincenzo Beschi, Silvia Palermo and Irene Tedeschi – Avisco association – Italy. – Direction – editing workshop. The workshop is organized by the people in charge of the Dutch National Film Festival for Students (NFFS – Nationaal Film Festival voor Scholieren). The participants in the workshop are the visitors of the festival from abroad. Duration: 5 days, afternoon hours. The workshop produces about 10 films during its course. – Open animation workshop under the responsibility of the Media Education Centre – Belgrade . During the workshop the participants are introduced to the animation technique (stop motion) with the help of the renown animation box by the Swede Erling Eriksson. It will be operational for 6 hours per day and open to any visitor. Small groups of children (up to 15) from local schools can also participate. – Two-day cinematic workshops totaling 6 hours each. They are addressed to visiting students from other areas of Greece. They take place during afternoon hours (3-6pm). Coordinators: the directors Nikos Theodosiou, Damianos Voganatsis. – Juries – film analysis workshops. Two workshops – juries will be operational: one for the films of the Greek section of Camera Zizanio (3rd and 4rth December) and one for the European section (5-9 December, from 10.30 to 13.30). Coordinators: for the Greek section, the teacher Sophia Giakmoglidou, and for the European section the writer Aggeliki Darlasi. Introduction to animation by Igor Gimbosh, 3D animator in the Media Education Centre- Belgrade. Short Film: from idea to screen by Antonis Papadopoulos, director, Artistic Director of International Short Film Festival in Drama. Documentary film, step by step by E. Maria Leonida, director.